← Do they know it’s Christmas (and that it’s not a happy song)? 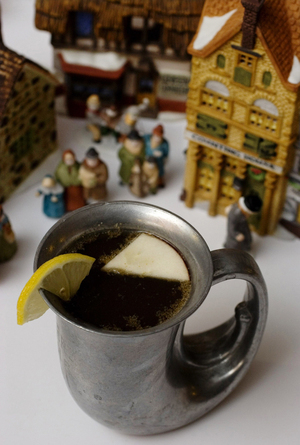 Have you ever had wassail? On NPR’s “Morning Edition” this morning, reporter Kathleen Osborn discusses her search for this very traditional English drink in New England. Have a listen. I’ve never tried it, but the following are three very different variations on this festive drink. Warm to just under a simmer and hold for at least 30 minutes. Adjust spice blend to your taste. For extra sweet wassail, add a bit of brown sugar. Enjoy on a cold winter night in the company of friends and family while singing to keep the dark at bay. Mix all ingredients together and pour into a decorative vessel that the whole family can drink from. Steep all ingredients for a half-hour on a low boil. Add brandy, rum or vodka as desired. Posted on 21, December 2011, in Drink and tagged drink, Morning Edition, NPR, wassail. Bookmark the permalink. 2 Comments.